Paternity Leave For Nigerian Men? 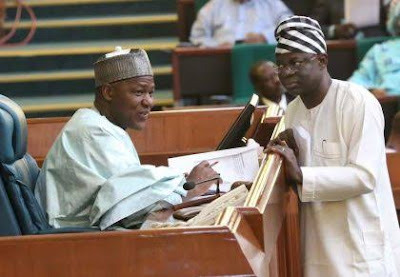 House of Reps Say "No"
Members of the House of Representatives on Thursday balked at the idea of granting paternal leave to Nigerian male workers. The lawmakers said Nigerian cultural and economic environment is not ripe for such privilege yet. As a consequence, a Bill for an Act to make provisions for optional paternity leave to all married male employees in private and public service by Edward Pwajok (APC, Plateau) subsequently failed to scale reading as it was roundly defeated with a uninimous voice vote on the floor Thursday. According to Pwajok, a Senior Advocate of Nigeria (SAN) the proposal for a two or more week (depending on the decision of the of House) paternity leave is to ensure that mother and child get adequate assistance and care from the father. He said the leave became important if the mother or the child has health challenges which will make the presence of the father very significant. He also said that the presence of the father will afford the child the care he or she deserved during that early period. “No better person can support a newly born baby than the father which will make the child more emotionally stable if the father stayed close. “This will not be peculiar to Nigeria alone, it’s done globally,” he added. While Saheed Fijabi (APC, Oyo), Nasir Ali (APC, Nassarawa) and Yusuf Tajudeen (PDP, Kogi) supported the proposal ssying that since it is a joint responsibility to take care of the child, the leave will afford the husband to take care of the child too. On the other hand, Betty Apiafi (PDP, Rivers) raised a technical challenge against the bill saying since maternity leave issue was discussed in the Labour Act, it would have been better it came as an amendment to the Act and not as a bill. Uzoma Nkem-Abonta (PDP, Abia), Rita Orji (PDP, Lagos), Nicholas Ossai ( PDP, Delta) and Kingsley Chinda (PDP, Rivers) aligned with Apiafi that the ammendment of the Labour Act would be more appropriate. According to the lawmakers, the men should be out trying to provide for the upkeep of the family rather than staying back at home. They said the leave may have a strain on the family if money is not attached to the leave. They also wondered how many times a man with six or seven wives would go on leave if the bill becomes law. The motion was roundly defeated in a voice vote.